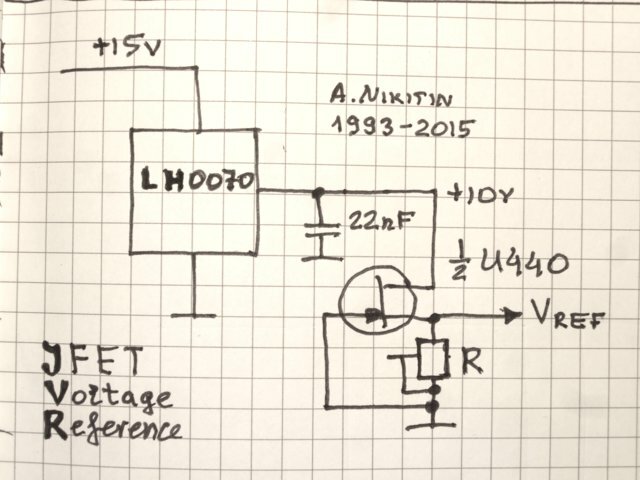 With so many discussions and data on precision voltage references, I've decided to resurrect my old (about 1993) idea of building my own voltage reference from scratch. At the time I had no means to measure it performance accurately, and even now, my two Keithley 2015 are struggling. The circuit I've built yesterday on my bench is deceptively simple, essentially one JFET and one resistor. I've used one half of U440 dual FET with a rather high (about 4V) cut-off voltage, connected a multi-turn W/W pot in place or R1 and adjusted the pot for a near-zero tempco of Vref output by heating the JFET with a soldering iron and looking at the voltage changes as it cools down back to room temperature. Then I've measured the resistance of the pot and replaced it with a couple of metal film resistors (standard type, 100ppm/C, nothing special). The beauty of this circuit is that the resistor changes reflect on the output voltage at about 1/100 of a value, i.e. 100ppm change in the resistance only creates about 1ppm change in the voltage - and the same applies to the supply voltage, about 1/90 ratio I've measured. I've used LH0070 as the supply regulator to avoid a possible supply influence though. The reference voltage for this particular sample of U440 is 3.75308V at 23C. I did not "tune" the reference further and the circuit was just sitting on the bench overnight. I've recorded the reference voltage for over 12 hours and for about 5C temperature change the voltage changed from 3.75308V down to 3.75301 at the lowest point and came back to 3.75308 again after the room warmed up back to 23C (making the tempco about 4ppm/C, nicely linear, so it can be tuned better). I've tried to see a thermal hysteresis by first freezing the JFET with a freezer spray and then heating it with a soldering iron for about 5 sec, however the voltage recovered nicely back to 3.75308V after the device cooled down. So here it is. If somebody with a better than mine measuring capabilities can have a go at this simple arrangement, I will be happy to see the results. I can see one serious problem with this circuit - the voltage reference point would be unique for each JFET sample , so it is difficult to use such a circuit in a production equipment. I will eventially build a proper boxed version with a scaling buffer to get, say, exactly 10V out of it. When I'll do it I'll post an update here. Voltage on LM399/LTZ's are also unique, but that's zero problems, as it's calibrated out in software/processing. Unlucky to me, I don't have LH0070 or U440 to test your circuit idea though. I've just used what was available in my lab . You don't need specifically LH0070 - "any" voltage regulator with a better than 100ppm/C tempco will do nicely, and U440 I've chosen for the metal case, again, "any" JFET has a "zero tempco" point, it is just reasonable to use ones with a higher cut-off voltage, i.e J112 may work well for example, though it is in a plastic case. Here is the JVR reference output voltage recorded by Keithley 2015 over ~6.5 hours from 10PM till about 4:30AM, the temperature dropped from 23C to 20C over that time with the heating switched off at midnight. Vertical scale is 2ppm/div. The tempco is easily adjustable to near-zero at a particular temperature. With a dual JFET like U440 I've used, the second FET's junction can be used as a temperature sensor . Here is a 30 min time span "zoomed-in" at the flat part of the graph, with 1ppm/div vertical scale. This is on the bench in open-air, so the "slow" variations easily can be due to thermal effects. Even a simple enclosure may make it better. On the other hand my Keithley 2015 noise at 10V 10NPLC is about 0.6ppm p-p from 10V, or ~1.5ppm p-p at 3.75V, so a large part of variations could be the 2015 . I already had the idea to use a BF245C as "zero quiescent current 5V" voltage regulator (e.g. for a real time clock IC) but never as voltage reference. The other "problem" is that you will need a output buffer. Every draw of current will change tempco + output voltage. 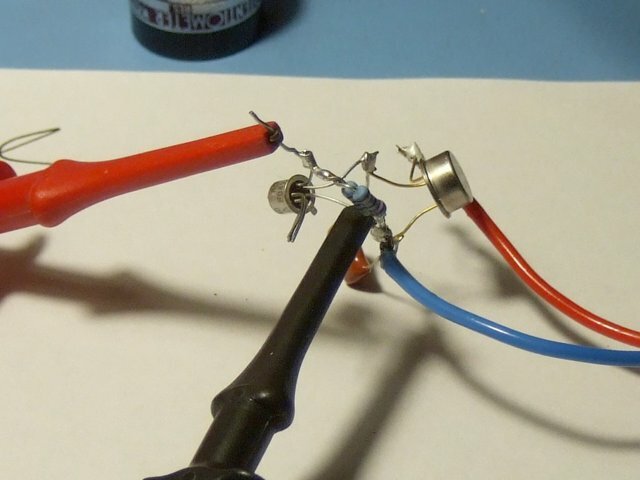 A buffer is required but it is not a difficult task to make one with a chopper opamp and, say, a foil potentiometer. These are just usual design details. What I like about that reference is that the tempco is adjusted "internally" to zero, and there is only one JFET makes the reference, the influence of other parts on the Vref output is easily manageable. The reference can be bootstrapped to the buffer output like in the circuit below (it is a simplified circuit, as one may need a start-up circuit to get this arrangement to work reliably on a single supply). That sounds interesting too. Do you have a schematic? XFET voltage references on the other hand have had some outlandish long term stability claims in the past, they are no longer present in the current datasheets ... but I'm not so sure they were too far off the mark. Look at this complaint from Linear about the claimed performance. Yes, without burn in they measured quite a bit of drift. After 400 hours though it became pretty flat, except for the large amount of 1/f noise which they intentionally didn't remove. Pity there aren't any hermetic XFET references. nothing special, I am using the pinch off voltage of the gate as voltage reference. Drain is input source is output. Gate is tied to GND. As the cirquit is very high impedant you will need 2*100nF for stability. A diode against reverse polarity. And a protection resistor against transients; thats all. Schematic + simulation is for 2N4119. With a BF245C I typically get around 4.0V idle and 2.8-3V with a 1K resistor as load. But usually a clock only draws some microamps. Input voltage is up to 25V. (30V). Would some foam and mylar be able to isolate the FETs well enough to use the second FET as the heating element? (If so you could just bias it with a source resistor and put a current limited voltage on the drain, it will have a single temperature equilibrium). Yes, I've looked at that option, however it is only possible for devices with a high enough drain current - not all of them are good in that respect. At the moment I would like to go further with the main reference circuit, the thermal stabilisation would come next. Today I've found an easy (and reasonably cheap) way to get standard voltages (5V and/or 10V) from this circuit. 10V is preferable because the output can be used to supply the reference . I'll test this idea soon and will update the thread with the results. No need to use Vg=0 here, a bit of drift from a resistor divider for the temperature setting isn't that critical, so IDSS isn't a limiting factor. Thanks. So the regulated voltage really depends on the current and varies from part to part? After looking at the prices for jfets (~20c ea), it seems like more of a curiosity than a practical application since LDOs like the AMS1117 and Torex 662K cost 3-5c ea. The FET's current is as stable, as the reference Vgs voltage and it just scales up. R2 should have a low tempco though. One important change from the first prototype. This circuit is still hard-wired and in open air on my bench, however I've used <10ppm/C precision resistors for R1 and R2. From the start I did not expect to get into single ppm/C digits so I've used cheap resistors. However I've found that if I tune the circuit accurately, the largest drift component comes from the resistors! Now I'll leave the circuit on overnight and record the voltage for 7-8 hours. P.S. - it also lookls like a lot of LF noise was coming from the resistor. Now the noise on the graph is dominated by the noise of the Keithley 2015 I use to measure the voltage. Alex, but now you are back to having the resistor drift having an unattenuated effect on your output voltage again. Goodbye potential long term stability. I am not planning to design a replacement for the LTZ1000 . And if you need a certain standard voltage you have to use some resistors. At least here it is only one really stable resistor required (and an opamp buffer, but that is not a problem). Here is the overnight data, the vertical scale is 2ppm/div. For about the same three degrees C temperature drop the voltage change was ~12ppm, or ~4ppm/C, at 5V with the additional scaling resistor. I may yet try to tune it a bit better. As U440 is not easily available, I've also tried a different (and very cheap) JFET - J112. The sample I've used has a near-zero tempco point at ~3.25mA drain current, ~1.75V Vgs. I've scaled it up to 5V with standard 100ppm/C metal film resistors and it again looks like these resistors are the main source of temperature-related voltage variations. The resulting drift, I would estimate at about 20-30ppm/C. Here is the result for a 30 min run in open air (2ppm/div vertical scale). Supposedly zero tempco for a JFET is near the pinch off voltage plus 0.63V. Would placing a few J112-based voltage references in parallel give better results, what do you think? I think it would be more sensible just to use good low tempco resistors, and, if you need the best stability, a temperature control. By the way, a single device with the same chip inside as the U440 is J211, still made by Fairchild Semi (and available from DigiKey at 15p each). By a coincidence i just went through "The art of electronics" 3rd edition reading on JFETs. The autors do not recommend using JFETs at high source-drain voltage (which your circuit is) because above a few volts gate current raises dramatically, by several orders of magnitude. I'd imagine this may have effect on this circuit out V drift, and make it dependent on the primary regulator output voltage which is the JFET input. But im not good enough with JFETs yet to say for sure. Anyway, something you may need to have a look at and perhaps to test.